February is the shortest month of the year, but then again, short is sweet! 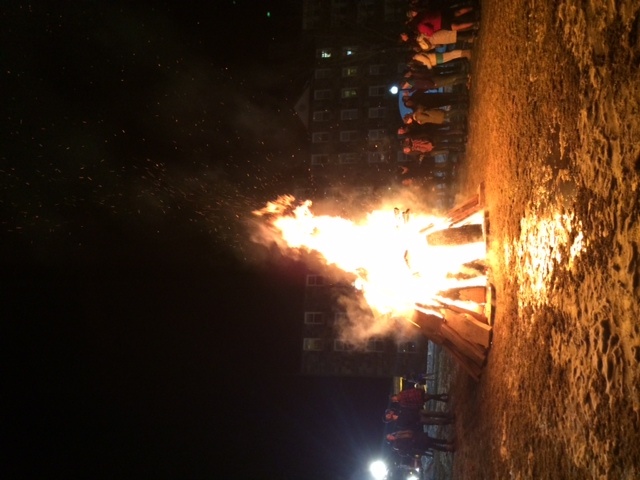 It’s one of my favourite months of the year at Midd: the days are getting longer, the spring semester begins, and it’s the month of Winter Carnival. This year we celebrated our 91st! Winter Carnival Weekend is a celebration of our varsity ski teams, where students go to the Snow Bowl or Rikert and watch the alpine and cross country ski teams race at home (that means students get Friday off to go watch races)! The carnival also entails a big kick-off bonfire and fireworks show followed by a comedian performance right across the street! 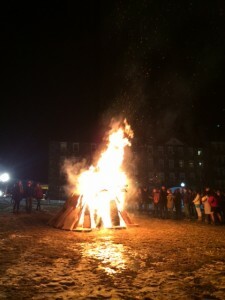 Everyone shows up to the bonfire in their big jackets and grabs a cup of hot chocolate to watch the fire grow, and soon coats are off because the heat from the fire (and the hot chocolate) is keeping everyone toasty. Soon enough, the fireworks are up in the sky and the DJ is playing tunes as everyone enjoys the evening! 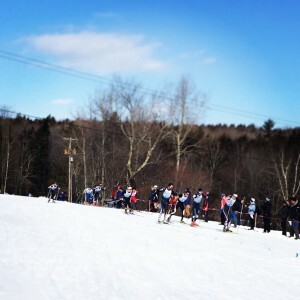 Friday is always the first day of races, and friends will get together and take the shuttle up to the Snow Bowl, or to Rikert to watch our teams compete, listen to some live student bands, and get some grub, and as the day is done they come back to campus just in time for a small concert to get their groove on! Saturday entails more races, an après-ski hot chocolate bar (yes we’re big on hot chocolate here- but don’t worry there is white chocolate too!) and the Ball. Every year, 1500 students will fill the decorated Nelson Arena and enjoy snacks, some drinks, and dance till they drop (or until the ball finishes at 2am). This entry was posted in Uncategorized on February 27, 2014 by Ashali Bhandari. 1. Snow-shoeing: In my four years here, I have tried a variety of winter activities. I’ve been skiing, sledding, and ice-skating. I tend to fall down a lot. So for the sake of my tailbone, I’ve decided I need to find a new winter sport. My friend suggesting I try snowshoe-ing by taking walks on the TAM (http://addisonindependent.com/node/2740) which is most importantly FLAT GROUND. Hopefully, I’ll be standing up straight and I’ll be able to explore Vermont in the winter! 2. Become a wine sommelier : Every j-term, seniors have the option to sign up for a wine-tasting workshop that meets once or twice a week. Finally, I was able to register with two of my friends and go down to the Sparkling Champagne and Wine bar to taste some delicious sparkling wines. I now know about the single and double fermentation process and the filtration processes. Next week we taste champagne, and then maybe I’ll become an expert! 3. Master GIS: This is probably the wackiest one on my list (yes, even more so than me thinking 4 wine tastings will deem me a sommelier). I’ve spent my j-term using a mapping software to learn how to determine trade areas of a grocery store and learning about different factors that impact site selection. It’s been great, and while I know that I will never be a “master”, I’m determined to become as knowledgeable as I can about using the software and tools that I’ve been employing. 4. MovieMarathonSunday: This may be the only time of year where my school work doesn’t demand attention 7 days a week. I’m going to pick out my favourite movies on netflix, make a pot of tea, and curl up in bed and stay there all day instead of braving the sub-zero temperatures! This entry was posted in Uncategorized on January 26, 2014 by Ashali Bhandari. It’s that time of year on campus: FINALS WEEK. The more I think about it, the more I realize that I have a very strong love-hate relationship with this week. Sometimes I think about the structure-less time where I can wake up as early (or late) as I like and study whenever I want. I have the leisure of going anywhere on campus and walking into a classroom to study without running the risk of walking into a 30-person lecture and having to turn right around and go somewhere else to work. I can choose to have a day where I don’t even need to shower or leave my house! I can cook, work, sleep, and procrastinate without stepping into the cold! And then I start to think about the work: the papers, the exams, the study guides, and I remember the “hate” part of the relationship. It’s the time of year when the library is so crowded you would think it was a (insert name of your favorite band here) concert – except it’s not. Despite the bad rep finals week gets, we do it pretty darn well at Middlebury, plus it means you’re one week closer to the holidays! This entry was posted in Uncategorized on December 12, 2013 by Ashali Bhandari. November 13th had been on my calendar for about 2 weeks. My alarm was set for 6:55 am. The night of the 12th, I put my laptop next to my bed and stuck a post it to it with all my desired classes and their numbers so I could register at 7am. November 13th was my last registration of college. Registration is the process by which students choose their classes for the next semester. The week before you’ll hear the dining hall buzzing with “are you taking this class” or “I really want to take that class but I bet its going to fill up with seniors” or “that professor is supposed to be awesome!” and for the first time I was in the first batch to register. Registration goes according to class year, so as the oldest in the school, we get first pick! As I started looking through the course catalog and started writing down classes I wanted to pick, it occurred to me that I could only take four! I remember sophomore year, thinking that as a senior I would take three classes, have a fun last semester, and now that the time has come I wanted to take 8!!! I finally decided to take cartographic design, modern architecture, economic history and thought, and the global economy. As I submitted my classes, I realized that was it. I would never again have to look at classes for future semesters and decide what to take, and I smiled because I’m going to enjoy my new classes to the fullest! This entry was posted in Academics on November 14, 2013 by Ashali Bhandari. It’s a small way to spread some neighborhood fun! By Halloween all of our neighbors must be ghosted, each and everyone. And the best part, is the bag of candy attached at the bottom for everyone in the house to share! The next step was for us to refill the bag with new candy and go stick the ghost on another neighbor’s house to continue the ghosting tradition! As the fall festivities continued, last week my housemate showed up with four pumpkins and one spooky looking jack-o-lantern making our living room feel like a pumpkin farm! A few hours later, our kitchen caught the fever as pumpkin seeds were cooked (as soon devoured) by my friends! And then last Sunday, my friend brought over two boxes of Funfetti cake: HALLOWEEN STYLE with orange icing and bat shaped sprinkles which lasted in our house of 6 for about 24 hours! And today, two days before Halloween, I’m starting to get my costume ready. I remember my first year, when I hadn’t celebrated Halloween in 8 years, buying a Queen of Hearts costume and being more excited than ever for people to guess who I was! The evolution of my costumes has been somewhat sporadic: starting with the girly Queen of Hearts and then moving sophomore year to the comical monopoly man whose stick on mustache refused to stay on, and the spooky Morticia Adams on the Monday which was Halloween. Last year I decided to become more traditional and do something scary as I turned into the spooky skeleton, and this year, I’m determined to be as creepy as possible as I’m attempting to make my own Grim Reaper costume. I went to our local Ben Franklin store and bought some black cloth for my cloak and a plastic golf club for my scythe. I bought some black and red face paint to make my face as scary as possible and hopefully it’ll be as terrifying as I hope. This entry was posted in Uncategorized on October 30, 2013 by Ashali Bhandari.